Getting ready for the "TRIPLE PLAY BLOG HOP" in one week! 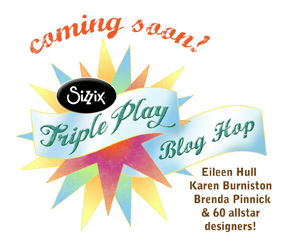 Work has began on my ideas using the Sizzix dies designed by Brenda Pinnick, Eileen Hull and Karen Burniston. So starting on November 3rd and continuing each week till December 15th, come and see some creative ideas designed by a great group of very talented people. I'm anticipating being surprised by the ideas each one will come up with. It will be fun and inspiring for me, as I think it will be for everyone that comes and "hops" along the blogs. Each of the participants have the above, "Triple Play Button" on their blogs. All you need to do is click on it to start and it will take you from one blog to the next by clicking "forward". It is set up to take you through the blogs so you can see each idea.